So…we have a good reason for not blogging in a while- I have been busy turning our blog into a cookbook! We are only distributing free copies to friends and family, but it has been pretty cool. It originally was a present for J for Christmas, but now family members are requesting copies of their own- yay! So, in order to make a second volume, we should probably get back in the swing of things. First step, French Onion Soup. 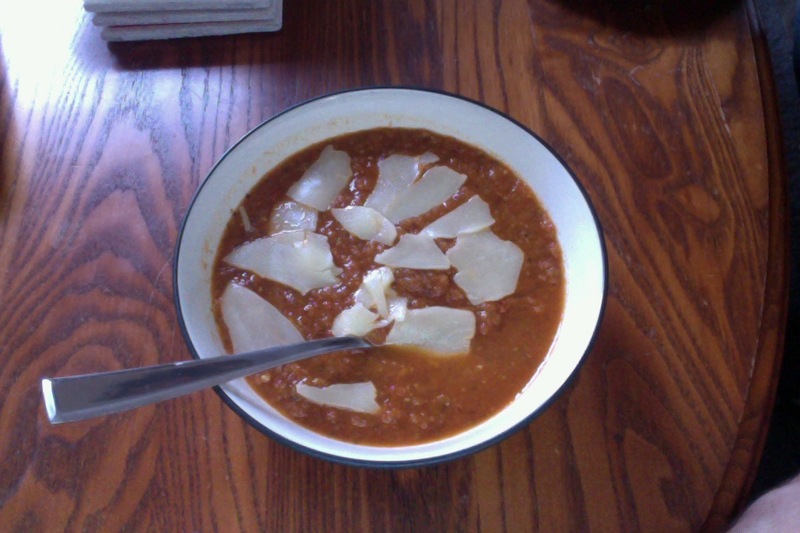 Now, I have never made French Onion Soup, so I was a little leery about making it. However, it turned out to be quite tasty. 2. Turn heat up to medium, toss in the 1 tsp. of salt, 1 tsp. of sugar and garlic, and stir again. This time, put the lid on it and let it go for about 30 minutes (mine was done at 25, but my stove runs really hot). Again, I did the chore, stir, chore, stir, chore, stir, etc. method. Every time you go back to the pot the onions should get more golden brown and delicious. 3. Skip this step if you can- I couldn’t: Turn off smoke alarm because you let the pot get too hot while you are trying to rescue your cat who has burrowed herself inside your couch upon discovery of all of the milk rings she has hidden under the couch for the last six months. 4. Rescue the pot by adding flour for a roux, then pouring in the wine, beef broth, and chicken stock. **I now made the cheese crouton-y bits. I took a small baguette and cut it in half. I cut the half into four chunks, rubbed 1/2 a garlic clove on the chunks and put a slice of havarti on top. I also took the other half of the baguette, split it in half, and placed a piece of American cheese on half. Put all of the cheese covered bread under the broiler for a couple of minutes until bubbly and slightly golden. I also made some tuna salad. 6. Serve soup in bowl with a cheesy crouton-y bit. 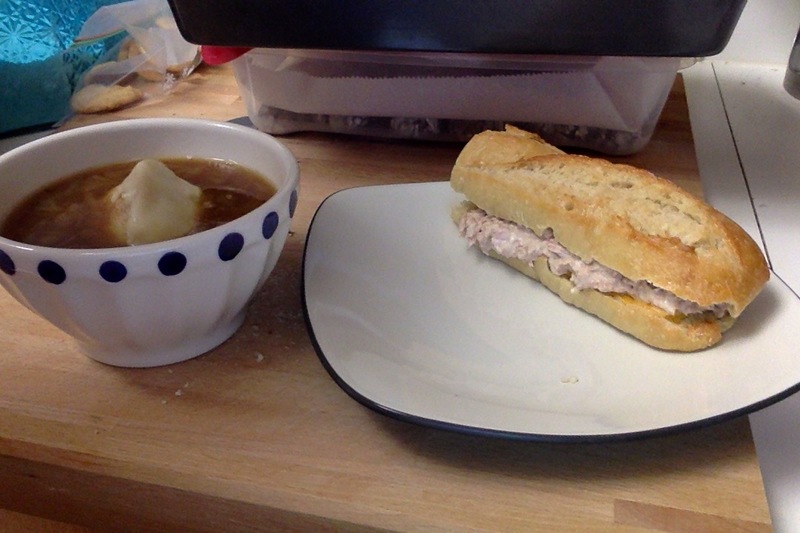 I also filled the other half of the baguette (with cheese melted on one side) with tuna salad for a nice tuna melt. A pretty good lunch! Happy (almost) new year! We can’t wait for you to see what we have in store for the coming year in food! -L (and Bingley who is now safely out from under the couch). We have been waiting for fall…cool weather, decorations, all things pumpkin and apple cider related. Yum. 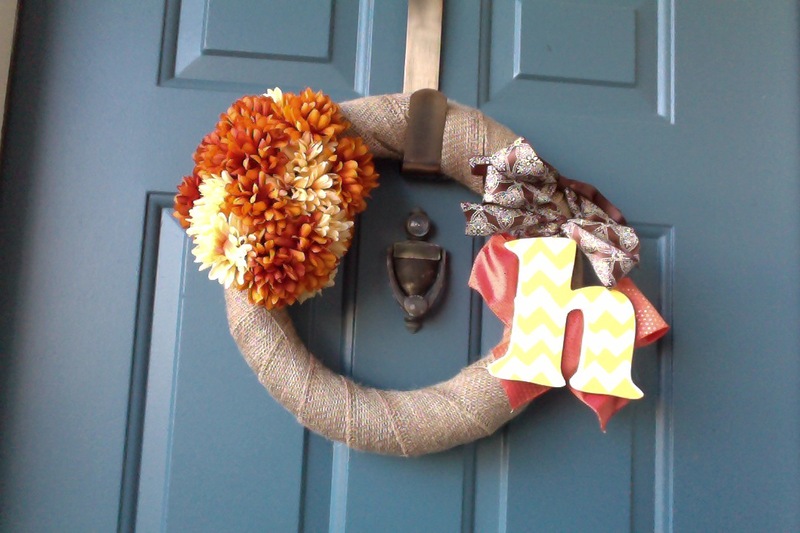 To welcome the season that shall arrive quickly, we made a wreath on our door this afternoon. 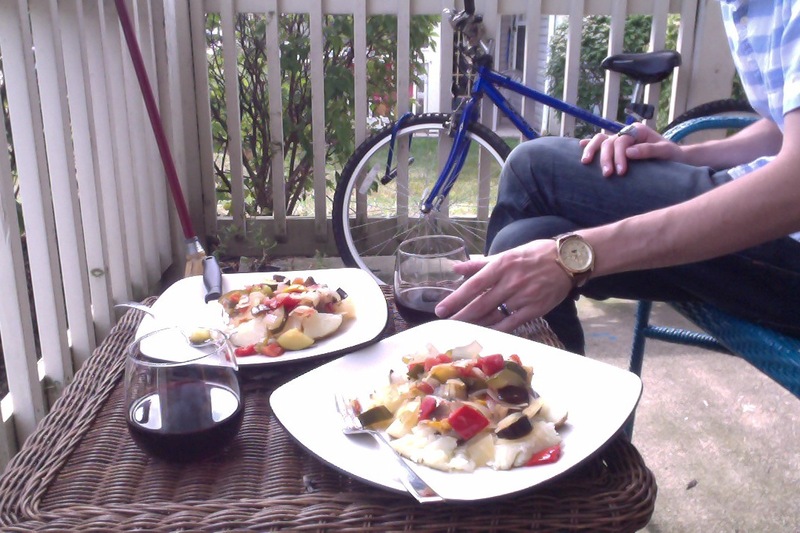 ….we also made some warm, hearty foods. Well, food…but made in TWO ways. 2. Drizzle olive oil into crock pot. 3. Dump in everything else, with an extra drizzle of olive oil. 4. Go to the farmers’ market for 5 hours while this cooks on high. 5. Serve over baked potato (we paired a lovely red wine with this for lunch). 1. Purée ingredients 1 and 2 in a blender. 3. Serve with cheese on top. We enjoyed both of these this weekend, and they were each great in their own way! Cultured, Handsome Fraternity Brother: Hey J- whatcha doin? Cultured, Handsome Me: Making brownies for us and the neighbors! Cultured, Handsome Frat Bros: Cool! This simply doesn’t happen any more. Recently, I’ve started making daft mistakes, such as forgetting the second cup of flour in a batch of peanut butter chocolate chip cookies (they were still pretty good- they just kind of congeal together and you have to sort of paw at them a little bit to get one in your mouth.) This time, I was attempting to make cheddar bay biscuits, like the amazing ones at Red Lobster that you find you’ve eaten the entire basket of before you even order your food. This time, I didn’t quite appropriate the dough such that it might match the recommended yield of 12 biscuits. I made nine. NINE BIGGUNS. 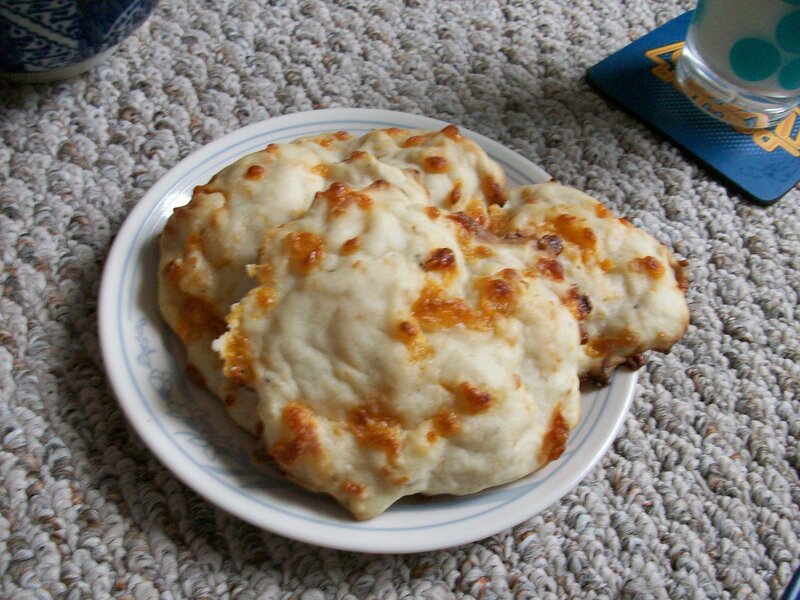 They were done after I left them in the oven a few extra minutes, but they had flattened under their own weight and turned into what was more of a large-diameter cheesy cookie. 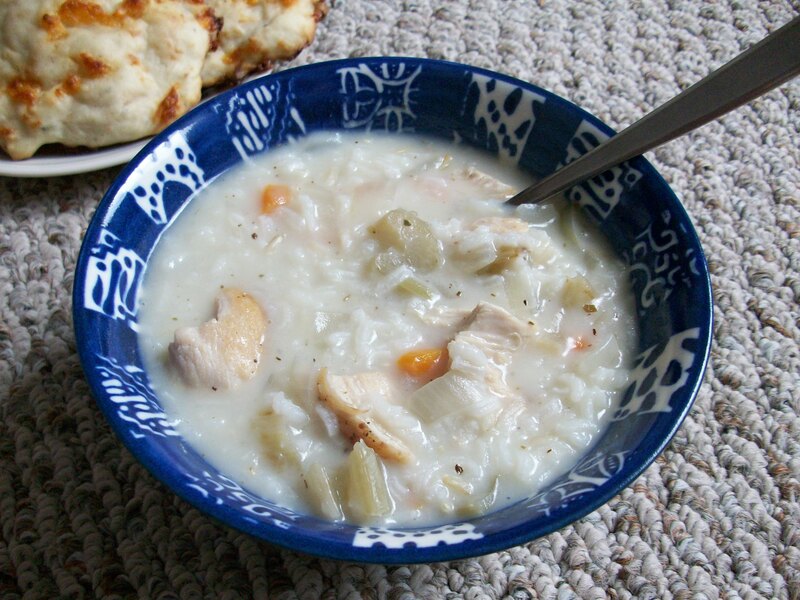 We dipped them into L’s perfectly cooked soup. Saute (fancy French word meaning “cook on the stove”) two chicken breasts in a pan with olive oil, salt, and pepper. Let that cool, and then chop it into cubes. clean and chop some celery and carrots. add them to the pot, saute for five-ish minutes. turn down the heat, simmer for a half-hour. In a liquid measuring cup (the glass one), add two tablespoons of flour, two tablespoons of olive oil, and one cup of milk. Pour it in the pot of soup.